If you defend punches today the same way you did as a beginner, something is wrong! 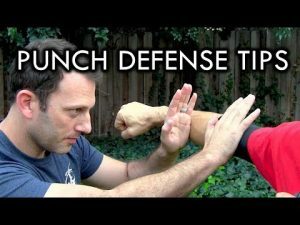 Here are some tips from Sensei Alec Rains of The Mat Martial Arts in Austin, Texas to help you defend against punches more efficiently and effectively. ►Like my tee shirt? Get one! According to Sensei Alec, the biggest mistake new students make when defending against punches is doing TOO MUCH! The fear of getting hit causes beginners to swat at the bad guy and push his arms away as far as possible. The problem with such big, gross motor movements is recovery time! When you commit yourself to a big push or deflection, you not only risk throwing yourself off-balance, you also require more time to flow into your counter or escape. The trick to more effective punch defense is to only move as far as you NEED to move. Yes, that might even mean letting the punch brush up right against you! To accomplish that, you must train to feel comfortable standing in the pocket. Jumping back or bobbing and weaving when you don't need to only wastes energy and takes you out of position to punch back. One drill to become more efficient and effective when defending against punches is to ask a partner to throw some strikes at you. Focus on breathing continuously… seeing what's coming… and relaxing as much as possible. You can use your hands or arms to manage the punches, but think of them only as training wheels. Don't think about pushing the punches away, think about getting your head and body out of the line of fire. When your defense is efficient, your counters and escapes will be more effective– simple as that. So, grab a partner and start off slow. Build up your confidence in the face of being punched and see how little you can do to stay safe! ►TRAIN WITH ME in person, online, or at a seminar. Keep fighting for a happy life! WARNING: The advice and movements shown in this video are for informational and educational purposes only. Consult a doctor before engaging in any exercise or martial arts program.